Helmut Lachenmann, the German composer born in Stuttgart in 1935, has been at the center of musical debates for nearly four decades and remains there, undaunted, today. His works offer both listeners and performers tremendous challenges — insurmountable challenges, some would say — but his music nonetheless is performed and people do listen to it (perhaps in the ways in which the composer intends). Vital to his aesthetic belief is the reformulation and renewal of musical traditions; why simply accept the hierarchy of traditions the evolution of music has handed down to us? He achieves this musical bouleversement by asking his listeners and performers to suspend, or perhaps completely reject, their inherited beliefs about music, because they serve only to hinder and distort the listening experience. His ability to achieve beauty through the use of unheard or undesired sounds is a testament to his meticulous craft. Judging by his influence, for better or worse, on the following generations of European composers, it seems that he has not only built a successful and important oeuvre but also a significant body of admirers, whose music shares some of his traits, but never with the same verve. Although his aesthetic has perhaps not served as the foremost model in new European music — and to his benefit: the fewer clones, the better — he nonetheless ranks as one of Europe’s reigning composers, both in terms of his music itself and his thoughts about music’s troubled past, present and future. Lachenmann’s attitude and output, signifying a reaction against the staid music of his student years, a break from dogmatic, jaded musical principles and a fondness for the music of the past, still resonates today. Lachenmann’s musical development began early. Born into a Protestant family in Stuttgart on November 27, 1935, Helmut Friedrich Lachenmann’s earliest musical experiences were those, not unexpectedly, heard at church. Especially intriguing to him was the sound of his church’s organ and chorus; later, from 1946-48, he sang in this choir, which specialized in the music of Orlando di Lasso, Heinrich Schütz and other pre-Bach composers. He began composing soon after and wrote many large-scale pieces, including a large symphony, but all of these early scores are now lost. For three academic years (1955-58), he studied composition and music theory with Johann Nepomuk David and piano with Jürgen Uhde at the Musikhochschule Stuttgart. A definite turning point in his career occurred away from the classroom, when he attended the summer courses at Darmstadt for the first time in 1957, where he found a mentor in the form of Luigi Nono, one of the few composers at that time of rampant serialism who openly embraced the past. Lachenmann became Nono’s first private pupil and stayed with him in Venice from 1958-60. He later had meetings with Alfons Kontarsky, Henri Pousseur, Frederic Rzewski and Karlheinz Stockhausen in Cologne in 1963-64 and vital encounters with the percussionists Christoph Caskel and Michael W. Ranta at the same time, the effects of which are still felt in his musical outlook today. What Lachenmann has attempted in his music is a clearly evident reanalysis and reconsideration of the past, as seen and heard through the same, perhaps clichéd instruments composers have used for centuries, but now with a different aim: disorientation, not superficial enjoyment. By taking the essence of so-called classical music, i.e., the notes themselves — not the fetishized veneer of both audiences and performers, or the weighty expectations of grandeur they have heaped upon them — Lachenmann has shown a keen ability both to place his work within a historical context and not recoil into any neo– movement. His music lacks the generalized, perhaps romanticized, notion of beauty: something immediately appealing, something refined, something through its undeniable charm persuading everyone of its excellence. Lachenmann’s music is appealing, but perhaps not immediately so; it is refined, but to such a degree that alienation is possible; and it is charming, but far from jocund. Is it likable? Is it accessible? Such questions are often asked. For these reasons, it is quite possible that average listeners will be disappointed when they hear his music. In his pieces from 1966 onward, his theory of a musique concrète instrumentale, formulated in an essay from that year, is first seen in a mature form. By this point, musique concrète (sounds recorded from everyday life) had been in existence for 20 years, but was now primarily mixed with, if not completely surpassed by, electronic sounds created in a studio. Although essentially a very crude form of musical expression, the musique concrète field had nonetheless created some haunting and unusually beautiful, almost idyllic, music. 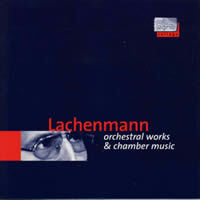 Lachenmann chose to take this same attitude and apply it to existing instruments by utilizing a rich palette of unorthodox instrumental effects. They do not exist as effects, however, but instead as characters in the musical dramaturgy, so to speak, as they do in most works of the traditional repertoire. Although his chamber works are as intimate as any ever written, they are also among his most experimental works. Because of the composer’s research into new capabilities of string instruments, the three string quartets (Gran Torso [1971-72, rev. 1978, 1988], Reigen seliger Geister  and Grido [2000-01, rev. 2002]) immediately stand out from his other, no less considerable, chamber pieces. They are replete with new techniques and ideas, but are all vastly different in nature. The first is abrasive, almost scolding; the second is an atmospheric, nearly hollowed-out world of sonic minutiae; and the third combines elements of both, but certainly leans toward the sound of the second. In his orchestral pieces, he employs unusually large, some would say Romantic-sized, orchestras, with the addition (in most pieces) of ad-hoc players using a variety of conventional and unconventional instruments, ranging from ping-pong balls to toy frogs to bathtubs and beyond; one or two electric guitars (one of the first composers to consistently use this instrument in an orchestral context); Hammond organ and/or pianos, especially the latter in recent pieces, where usually two are used as giant reverberators; and a vast array of percussion instruments. The orchestral works are thus colorful, but not at all excessive in their treatment. 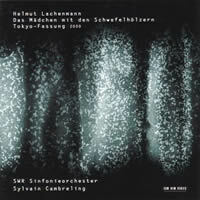 Lachenmann manages these large forces with utmost care and an almost Webernesque sense of timbre. In fact, it could be said that the electric guitar and Hammond organ are to Lachenmann what the mandolin and celesta were to Webern: instruments whose use was sparse, but whose unmistakable qualities were beneficial at the right moment. Whether his redefinition of music encompassing and embracing all sounds will survive and/or be expanded upon remains to seen, but one could only hope that his experiments — successful experiments — are not forgotten when the time comes again to reevaluate what we as listeners hear. For those willing to venture into terra incognita, here are five discs I recommend as ideal introductions to Lachenmann’s multifaceted soundworlds, though of course, experienced listeners will almost certainly have these in their collections already. 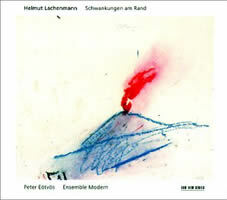 The best place to start is an ECM New Series recording of three watershed works in his oeuvre: Schwankungen am Rand (1974-75), Mouvement (– vor der Erstarrung) (1982-84) and “…zwei Gefühle…,” Musik mit Leonardo (1991-92). The first piece is scored for brass and strings, according to its subtitle, but in German, Blech means both brass and sheet metal. Thus, in addition to brass and strings, some of which are deployed throughout the concert space, there are two pianos and four thunder sheets played by two percussionists, not to mention an additional member of the string family: the electric guitar, here two, in fact. For the most part, it is a quiet, almost static piece (the title, Fluctuations on the Fringe, implies that the fringe here is not only that between the instruments themselves, but also the border between noise and silence), punctuated by occasional brass outbursts; the pianos lead the way most of the time, however, their steady cluster pulse like a beacon. Although Eötvös’ rendering is much quicker than the previous one by Bour (see recording 2), it does not at all seem rushed; the music still flows very naturally and efficiently. The big advantage is the overall improvement in recorded sound. Mouvement (– vor der Erstarrung) is an entirely different piece, one characterized by much subtler, much more refined motions. It sounds almost like a direct dialogue with the music of the past, presented through the eyeglass of the modern world. The title refers to paralysis. Perhaps the piece acknowledges life — indeed perhaps unwittingly — within a situation where paralysis pervades music. Originally written for Ensemble InterContemporain and premiered by this group under the present conductor, this piece has been recorded elsewhere, equally brilliantly, but its inclusion here makes this disc even more laudable. Lastly, “…zwei Gefühle…,” Musik mit Leonardo is another of Lachenmann’s trademark pieces, one made especially famous by Lachenmann’s frequent reading of its solo part (or parts; here it is done, as originally intended, by two people: Franck Ollu and Ueli Wiget). It takes the refined nature of the previous piece to another level, but is more uncompromising in spirit: Instruments are used, as usual, in extreme but surprisingly beautiful ways, and the text is delivered in a completely staccato, fragmented manner, perhaps off-putting to some, but not at all overused. The text itself is by Leonardo da Vinci, spoken in German translation; even in English or Italian, though, it would be identifiable or recognizable only in spots. This piece was later incorporated into Lachenmann’s opera Das Mädchen mit den Schwefelhölzern (1990-96, rev. 1999), where it forms a crucial point in the middle part of the piece. Next I would suggest a col legno release which compiles earlier recordings by this label onto one budget-priced CD. It contains the premiere recordings (all live) of Intérieur I (1965-66), Schwankungen am Rand and Air (1968-69, rev. 1994; the revised version is the one presented here). Intérieur I has been described by the composer as a breakthrough piece, perhaps his unofficial Opus One. Scored for a solo percussionist performing in a horseshoe-shaped setup, the piece is a direct result of Lachenmann’s fruitful contact with Caskel and Ranta in Cologne a few years earlier. Its emphasis on primarily unpitched instruments, including various cymbals, gongs and metallic objects, marked the earliest phase of Lachenmann’s experiments in bringing the production of sound, even its supposedly ugly attributes, to the surface. It is not a mature work, but still noteworthy. The Schwankungen available here is the live recording from its premiere at Donaueschingen in October 1975. Ernest Bour, the stalwart conductor of the European avant-garde, brings a great reading, but the recording technology of the time leaves some of the piece’s more delicate moments slightly hazy. That is a minor drawback, but I personally prefer the somewhat slower tempi of his reading to Eötvös’ recording; this one is a full five minutes longer, with greater tension — perhaps abandon! — in the brass. The final piece is the percussion concerto Air. Its 20-minute course includes something unique in Lachenmann’s music, a cadenza. It occurs toward the middle of the piece, however, not the customary position nearer the climax. Its part is entirely free for the performer and typically lasts a few minutes; here these moments of quiet repose serve as a useful transition between the anxious figures of the beginning and the occasionally absurd sounds, including omnipresent croaking frogs, of the piece’s culminating sections. Again, there is a focus on metallic tones, including the soloist’s crystalline Japanese temple gong and the distinct fuzz of electric doorbells operated not by the soloist, but instead by ad-hoc players, often coupled with abrasive sounds of gongs or metals. The title could mean so much: the air of other planets, as sung in Schoenberg’s Second Quartet, maybe, or the slow palpitations of breath signified by the instruments, including brass occasionally filled with water. No matter: The result is a piece which depends not so much on showy virtuosity but rather on a more personal, intimate skill. 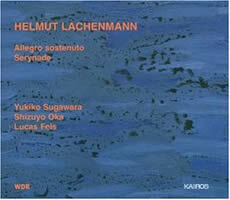 Now a glimpse at two important recent chamber works by Lachenmann: Allegro sostenuto (1986-88, rev. 1989, passim) and Serynade (1997-98, rev. 2000), as recorded by the relatively new, but very ambitious, Austrian label Kairos. The trio — clarinet doubling bass clarinet, cello and piano — Allegro sostenuto is, as its title declares, a prolonged allegro of 30 minutes. Nonetheless, it is much more tranquil, almost somber, than one would imagine an allegro to be. Here Lachenmann is at his most sublime, still making good use of extended techniques, but here they are awash in an almost surreal musical glow of dialogues and solos. The performance is excellent and though the piece has been recorded elsewhere, the easy availability of this CD makes it especially priceless. The second work, Serynade, is also a half-hour in duration but for only one instrument; it could be called a duo for piano and pedals, as the pianist must navigate an almost ungodly web of pedal requirements. One seldom encounters a piece of such abundant energy and variety; its moods range from the solemn, occasionally repeating blocks of the beginning, to swiftly running passages covering several octaves. It is a showcase of virtuosity, one not to be undertaken by easily fatigued pianists, and is throughout a beautiful work, fully engaging the listener in turns both serene and tempestuous. The work was written especially for the composer’s wife Yukiko Sugawara and for those wondering, the y in the work’s title alludes to her. 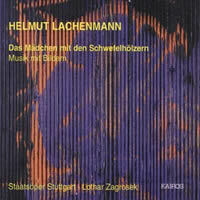 Up next are both recordings of the composer’s only theatrical experiment, the opera Das Mädchen mit den Schwefelhölzern. I know, picking two recordings is technically cheating, but the pieces are somewhat different and each interpretation merits a listen. The first was made by Kairos and the second by ECM New Series, both labels mentioned earlier. Although this work is less than a decade old, it has already received stagings in various parts of Europe and in Japan. The second performance captures the composer’s revision, sometimes called the Japan version, and the initial recording done by Lothar Zagrosek and his Staatsoper Stuttgart crew — who have since put it on many times — dates from its first run. The piece is essentially unchanged, except in small but to Lachenmann meaningful instrumental details and in the length of the aforementioned “…zwei Gefühle…” which is abridged in the new version to about half its original duration. It is a piece of amazing power, all originating from unlikely text sources, including the classic Andersen fairy tale, some of Nietzsche’s most famous poetry, a text about the volcano Stromboli by Leonardo da Vinci, and a prison letter from Gudrun Ensslin, Lachenmann’s childhood friend. These combine to make a compelling statement about the world today, a pointed but oblique criticism of a world which cares not enough for its people. The protagonist’s suffering is constantly felt throughout the piece, but never is it a detriment or nuisance; quite on the contrary, the listener is drawn into her struggle for life against the elements. The enormous orchestral forces, including more than 100 players, further create this eerily familiar yet frightening world. It is a work difficult to produce because of the music’s inherent theatricality, but a piece chilling even in one’s living room. The addition of the Japanese shô mouth organ, famous for its lament-like, sustained tone, creates a further level of drama and fright in this score. On the new recording, Eiko Morikawa and Nicole Tibbels are the sopranos, Helmut Lachenmann the speaker, Mayumi Miyata the shô soloist, Tomoko Hemmi and Yukiko Sugawara the piano soloists, and Sylvain Cambreling leads the SWR-Vokalensemble Stuttgart and SWR-Sinfonieorchester Baden-Baden und Freiburg. The old one features sopranos Elizabeth Keusch and Sarah Leonard, speaker Salome Kammer, shô-player Miyata, pianists Hemmi and Sugawara, and Lothar Zagrosek conducts the chorus and orchestra of the Staatsoper Stuttgart. Soloists, both vocal and instrumental, are universally consistent and it is especially interesting to compare Kammer’s female reading of the Leonardo da Vinci text with Lachenmann’s shortened reading: a great contrast indeed. ECM New Series 1858/59 (new) and Kairos 0012282KAI (old). My last pick is a Kairos recording of three important orchestral works, Kontrakadenz (1970-71), Klangschatten – mein Saitenspiel (1972) and Fassade (1973, rev. 1987), as issued by Kairos. 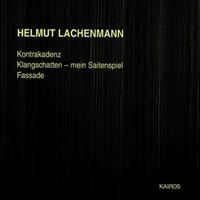 The first work is, in my opinion, Lachenmann’s finest: Kontrakadenz. It is shorter than the other two and also, I believe, more immediately accessible. That statement does not mean, however, that it is transparent and/or catchy; it is still a challenge. Toward the beginning, one hears various percussive rustlings, including falling ping-pong balls, coins, etc. and after a while two ad-hoc players turn on a radio and tune into someone speaking, in this case the composer himself mentioning the performance that the listener is hearing. It is a strange moment of irony. The piece is also notable for its unusually prolonged climax, one employing what could be called motifs: A sustained Hammond organ figure, commented on by the electric guitar and percussion, then leads to a crescendo tam-tam strike, after which roaring brass and strings enter the fray. It is a passage repeated — with variations, naturally — several times before the work attains its proper end. This radio recording was made soon after its 1971 premiere. Klangschatten – mein Saitenspiel is a game of strings, as its title implies. The strings in this case are 48 standard strings, plus three pianos employed in such a manner as to blur the barrier between percussion and string instruments. Both pianos and strings are wont to play in groups and in changing intervals and roles; the pianos play throughout the piece, but it is not overtly clear that there are three pianists; one might think there are only two (or possibly only one), so sparse is their material. Their isolated notes, sprinkled across similarly irregular patterns in the strings, are fundamental to the piece, but the sustained slow tempi and quiet dynamics may make this work more difficult for novice listeners. Be patient! This is one of the most infrequently performed of Lachenmann’s pieces (no mean accomplishment); the recording is the premiere from December 1972. Fassade, here in its revised form, is more immediately appealing, but is still replete with Lachenmann’s signature taste for the extraordinary. The composer calls it a secret march and indeed it has forward propulsion throughout most of its 22-minute course. As in Kontrakadenz, there is another element at work in this piece; instead of a radio, it is a tape which features mostly radio static, white noise and occasionally a sliver of a voice. When used in tandem with large orchestral forces, including especially large quantities of brass and percussion, the overall noise factor is very high, a fact which makes its more subdued moments even more prominent. It is a finely balanced work of extremes. Whether you pick up these recordings or come across others, I urge you to give this compelling composer a chance. It could very well change your outlook on music.